In 1959/60, Greenside Mine played an important part in attempts to control the proliferation of Nuclear Weapons. The following is an extract from 'Grey Gold', Samuel Murphy's excellent book about Greenside Mine. Both charges and the stemming were put in place by 17th December 1959, when the West Crosscut was sealed by two brick walls, one in the crosscut and one in the nearby South Drive. 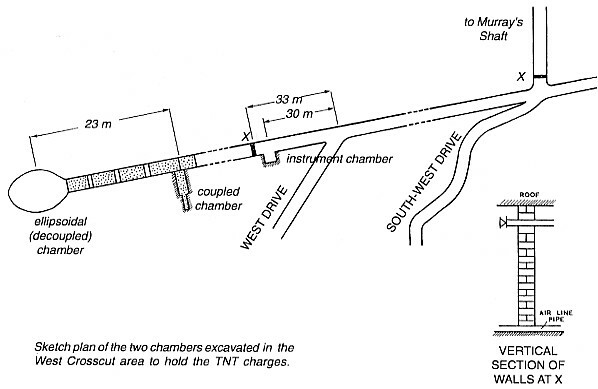 The equipment which would fire the charges was installed in the West Crosscut at a point 285 ft from the smaller coupled charge, and was controlled from the surface. Almost anything can produce vibrations of that size, so sites were chosen where there were no busy roads, trees through which the wind could whistle, or nearby becks which could mask the weak signals from the Greenside explosions with their own background noise. 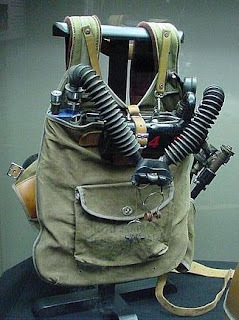 A nearby telephone link was essential in case radio communications failed at the critical time, for all the stations had to start recording just a few seconds before the detonation, and the time signal 'pips' on the BBC radio transmission or the GPO talking clock were used to obtain this precise timing. The sites which were selected for seismic recording were: 'Foulness Castle' NGR 364175, a code name invented by Eric Carpenter for the Pitchfords' house near the Low Mill, 0.5 miles from the test point, where the nearest seismometer was located; Low Hartsop NGR 412129, 4.5 miles from the mine at the end of the road running through the village; Outgang Farm, Helton, near Penrith NGR 506219, 9 miles from the mine in an old quarry near the lane leading up from Helton village; Dry Howe Farm, Selside, in Sleddale NGR 528021, 14 miles from the mine in a field to the south of the farm buildings in a fairly well wooded valley; Underwinder Farm, Sedbergh NGR 643927, 23 miles from the mine at a height of 600 feet up the side of a hill; Malham Village, Yorkshire NGR 903631, a site 47.5 miles from the mine in a field by the Malham to Malham Tarn road on a limestone outcrop 300 yards from the village. There followed a period of waiting as the mine was cleared of noxious gases from the huge explosion. It had been calculated that the first charge would release over 20,000 cu.ft. of poisonous carbon monoxide, small amounts of hydrogen cyanide gas and nitric oxides and nearly 5,000 cu.ft. of explosive hydrogen gas, so the test area had been sealed off with brick walls and a large Roots blower installed to pump out the dangerous gases through a pipe into the shaft, fresh air coming in through a one-way valve in the wall to replace the exhausted gas. 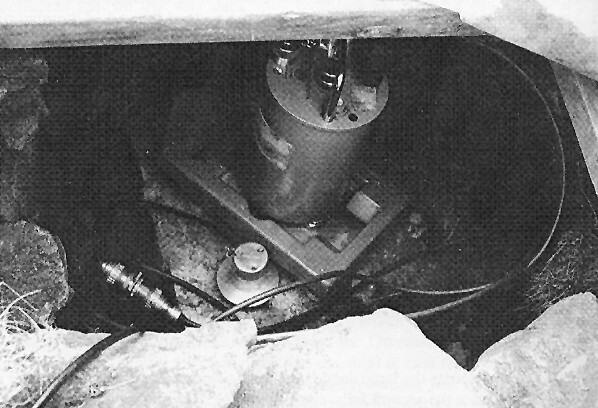 The blower was switched on before the detonation and although some of the containment walls were destroyed, the blower was undamaged and it was able to carry on clearing the air after the detonation. 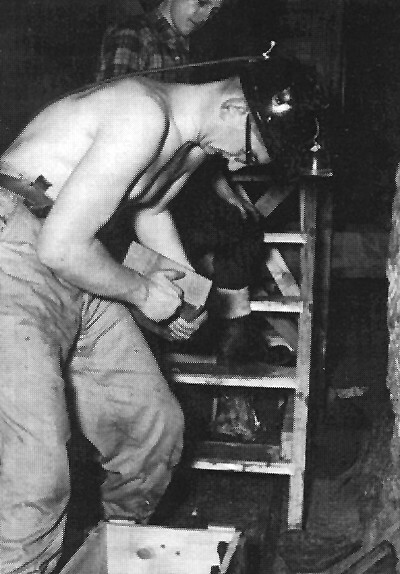 Re-entry of the mine was a dangerous process and this was carried out by trained rescue teams from Greenside and neighbouring mines who were used to wearing breathing apparatus; the 'greenhorn' AWRE men were banned from the mine until it was declared safe. GREY GOLD by Samuel Murphy is published by Moiety. The book describes the history of Greenside Lead Mine from 1825 to 1962.